There is a limit to number of times activation of Windows 7 can be made online automatically, even though the product key been used to activate Windows 7 is genuine and legally paid for. The online activation limit brings inconvenient to Windows users who love to reformat and reinstall Windows more than frequently, causing them to fall back to time consuming and cumbersome phone activation with many numbers crunching. Callers have to enter installation ID which consists of a total of 54 numbers in 9 groups of 6 numbers with phone’s keypad, and then receive a confirmation ID made up of 48 numbers in 8 groups of 6 numbers to enter on Windows 7’s activation wizard. To avoid the dreadful phone activation, and possibly to avoid contacting Microsoft for the purpose of activation to protect privacy, there is undocumented way to preserve current Windows 7 activation status by backing up several software licensing related files with the product key, and then restore them on the reinstalled Windows 7 system. Windows 7 system activated by restoring backed-up activation status works exactly the same with system that is activated online or by phone, but in offline mod without the need to connect to Microsoft’s activation server or even Internet access. Instead of having to manually copying the required system files and retrieving the product key, there is a software utility called 7Tokens Manager that automates the activation backup and restore procedure on Windows 7. 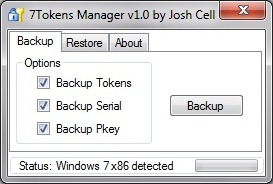 7Tokens Manager, developed by Josh Cell, makes a complete backup of Windows 7 activation, which can then be used to be restore in a new installation to achieve instant offline activation. No further activation step is required. Backup any type of activation license from retail, OEM or MAK distribution channels. Automatically backup digital certificate, product key (serial number), tokens dat and other other license files. Very lightweight and fast, though it may takes up to 5 minutes to restore activation due SLMgr.vbs working. Compatible with all editions of Windows 7, namely Windows 7 Starter, Windows 7 Home Basic, Windows 7 Home Premium, Windows 7 Professional, Windows 7 Enterprise (not support KMS activation though) and Windows 7 Ultimate). Download 7Tokens Manager from MDL Forums. 7Tokens Manager supports activation done with product key of Retail, MAK, OEM:COA, OEM:NONSLP and OEM:SLP channels. OEM:SLP activation typically does not go through online activation, as it use System Locked Pre-activation (SLP) to gain activated status upon verifying matching BIOS SLIC, OEM cert and OEM:SLP product key. However, the 7Tokens Manager can still be used to backup the necessary license information just in case you want to clean install the computer without crapware that installed by the manufacturer. In this case, 7Tokens Manager can restore necessary activation-related files and CD key to gain back the original OEM activated status (only if you’re on same edition of Windows 7).